Yes blog fans I am giving away yet another free book simply for the asking. But today's giveaway is different for two reasons. 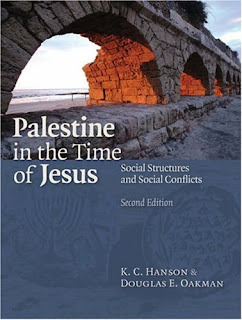 First, I am leaving to dig at Tel-Gezer next Friday and therefore won't be posting Friday Book Giveaways until after I return later this summer. Second, this is not the first time I have offered this particular book. This is the same book that someone won at the beginning of May, but never checked back to see if they won. This is also why I instituted the five day limit on claiming prizes. So here it is on offer once again. So please enter your name below and I will announce the winner sometime on Sunday, June 5th. Also, you will need to claim your prize by Wednesday if you want me to send it out before I leave the country. When discussing the Bible with people I sometimes hear the statement "there are so many different interpretations of the Bible I don't think that it is really useful anymore." They will point to various opposing interpretations that have to do with issues like slavery, abortion, divorce, violence and a host of other issues that are mentioned in the Bible. As they correctly point out, there are usually a number of people on both sides of any debate who can and do use the Bible to support there point of view. Some who witness these debates conclude that the Bible is no longer relevant nor needed. Richard Elliot Friedman and Shawna Dolansky have an excellent post on the Huffington Post The Bible as Relevant (And Misunderstood) As Ever. Here is some of what they have to say. Sometimes the Bible says what people think it does. Often it does not. Sometimes it presents multiple perspectives on the same issue. And on some issues it says nothing at all. 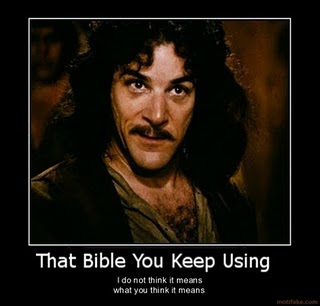 The Bible is frequently mistranslated, misquoted and misunderstood. Why? For one thing, people usually read it in translations, and without knowledge of its original literary or historical context. And they rarely read it in its entirety, so they end up pulling out small pieces: quotations and passages that seem to say what they want them to. Sometimes they are well-meaning. Sometimes their motives are not so pure. But this does not mean that we can't use the Bible. It doesn't mean that we can't find what it has to say about the big issues. The Bible's value, above all, is as a guide to lives. And we mean to all of our lives, whether one is religious or not, whether one is Christian, Jewish, or from another religion or no religion. Some people think of fundamentalist Christians and Orthodox Jews as the ones who connect their decisions to the words of the Bible. But that is not correct. One finds scholars, clergy and just folks, from all across the religious spectrum, who read, study and care about what the Bible says on things that matter to them. And one finds many who have never read or studied the Bible who still share a cultural sense of its importance as a foundation for morality and virtue. The Bible is a source of human experience and of wisdom, and wisdom is something we need. We can argue about which biblical passages are historically accurate, but, still, it is the first history writing on earth.The Bible's oldest prose was written when Herodotus's great-grandmother was not yet in preschool. We can question the morality of any given story or law, but still the Bible is an extraordinary repository of remarkable stories, exquisite writing and revolutionary laws. Indeed, when we argue about these things, we are participating in a 2,000-year-old process that the Bible itself started us doing. You may say, "But there have been times in history (and the present) when people used the Bible for harm: burning 'witches,' attacking 'infidels,' defending slavery." True, but that, precisely, proves that we cannot ignore it. The fact that it has both inspired people to do great good and been used by people to do great harm means that it is really important for us to pay attention to it -- and to get it right. This the beginning of a series for them and if I have time I will try to interact with their subsequent posts. 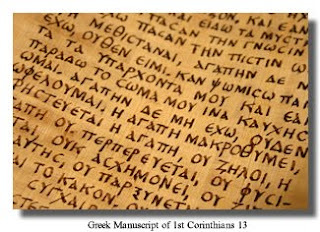 The Ehrman Project has posted an answer to someone who asked about scribal alterations to the New Testament text. The person notes that some alterations were made to New Testament documents for theological reasons. They want to know how this squares with the claims of inerrancy. The response begins by noting that inerrancy and inspiration only apply to the original autographs and that textual criticism can help scholars determine what those autographs looked like. The responder then suggests that theological alterations do not have any impact on the original autographs. "If one claims that the scriptures are inerrant in the original autographs, the practice of textual criticism can help scholars determine which variants are more likely to be original and, therefore, inerrant." The problem with this response, however, is that we do not have the original autographs and ultimately cannot be sure what they looked like. Yes, we are probably very close. But there is no guarantee that the copies of the copies we have are exactly the same as the originals. Let me give two examples both from Paul's letter to the Thessalonians. The first comes from 1 Thessalonians 3:2 and is an example of an alteration theologically motivated. In this verse Paul calls Timothy "God's co-worker." This was a problem for some scribes, however, since they saw this as perhaps making Timothy equal to God. Thus some variants drop the reference to God, others read "God's servant" rather than "co-worker" and some have a combination of "co-worker" and "servant." All of these are attempts to alter what looked theologically improper to the scribe. And the fact is, while "God's co-worker" may be original, there is very good evidence for the other readings. Usually the more awkward reading is accepted as original, and in this case it may be. But this is such an unusual way for Paul to refer to others it may in fact not be original. Thus, ultimately we are never really sure if it is correct. The second example comes from 1 Thessalonians 2:7. Here Paul says one of two things. He either says "we became gentle among you" or "we became as children." The problem is created by the fact that in the manuscripts there are no spaces between words. Thus we have two words smashed together and it is not clear where one of the letters should be placed. If it belongs on the end of the first word then the reading is "gentle." If it belongs on the second word then the reading is "children." No one knows for sure. The internal and external evidence gives equal weight to both. The KJV, NAS, NRSV, and CEB all have "gentle." But the NIV has "children." But the NIV has changed. In 1984 it too read "gentle." The fact is, we don't know. So while it is certainly a problem that we have to deal with variants to the New Testament manuscripts, some are the results of mistakes and others were purposely altered, I think it is misleading to suggest that we can somehow get back to the original. No one has seen them in a very long, long time and we are never sure how close we are. Rather, we have to work with what we have and acknowledge our limitations. So yes, scribal alterations do present a problem for the belief in inerrancy because it ends up making claims about the autographs that we cannot support. One line I use on my students when I talk about ancient manuscripts is that archaeologists love other people's garbage. It's true. The stuff that one society throws away is the treasure trove of later generations. A recently published book provides a good illustration of this maxim. Adina Hoffman and Peter Cole have provided us the story of the discovery and significance of the Cairo Geniza in their new book Sacred Trash:The Lost and Found World of the Cairo Geniza (Schocken, 2011). A Geniza is a sort of storage room attached to a synagogue where Jews would store their worn out or disused sacred documents. The Cairo Geniza was discovered in 1896 by two Scottish sisters. 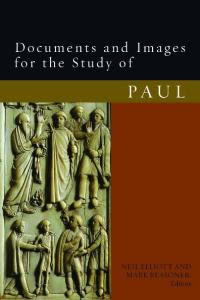 It is important because it contained 280,000 biblical and personal documents that extend back 1000 years. 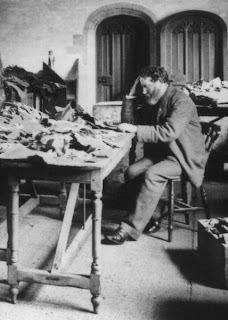 The sisters reported their discovery to Solomon Schechter who began the long and ongoing process of sorting, identifying and translating those documents (see picture above). The find has been as important as the Dead Sea Scrolls. In my own recent work on Cain and Abel, targums from the Geniza were an important link in Jewish and Christian interpretations of the story. Below is an excerpt from a short review of the book and a short video in which the authors discuss the importance of the find. Chance encounters on street corners. Secret trips abroad. Whispered hints of buried treasure. To those of us steeped in the writings of John le Carré and Alan Furst, all this smacks of business as usual within the world of espionage. But, as Adina Hoffman and Peter Cole’s new book, Sacred Trash: The Lost and Found World of the Cairo Geniza, reveals, such goings-on were once as much the province of scholars as spies. In the telling of how, against all odds, a “pestiferous wrack” of papers, as one Cambridge professor put it, became one of the most important finds of the late 19th- and early 20th century, Sacred Trashtransforms life within the dusty, dry, and often desiccated groves of academe into something akin to a giant romp, a thrilling adventure yarn—hijinks among the highbrow. Adina Hoffman and Peter Cole on Sacred Trash from Tablet Magazine on Vimeo. I have heard this quote thrown around from time to time, but am not sure who said it. Does anyone know? Is it Jurgen Moltmann? If so, where can I find it? Congratulations to Jonathan Kung! He is the winner of this week's book giveaway. This weeks give away was K. C. Hanson and Douglas Oakman Palestine in the Time of Jesus (Fortress, 2008). Jonathan, send me your details at jbyron@ashland.edu and I will send you the book. Remember, you have five days to claim your prize or it goes back on the shelf. Those who did not win this time can check back again next week for another chance to win.